When you set up Front Chat, you can securely pass user names and email addresses to the Front Chat widget to recognize logged in users automatically. Install the Front Chat script on your site, web app, or Electron desktop app. Your web or app developer will need to modify the script with additional code that calls the Front Chat API to pass user names and email addresses to the widget. You will need to sign the user identity with the Verification Secret found in your Chat settings to ensure that the information is trusted and secure. If you have any questions about the set up process after reading the Chat API documentation, please reach out to our support team. Passing this information is completely up to you. 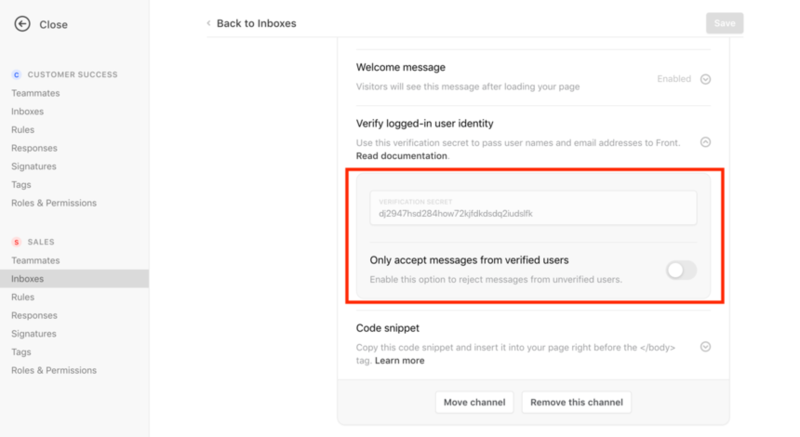 You can also pick in your channel settings whether to only accept messages from logged in users and reject messages from unverified (logged out) users, or to accept messages from both. Identified users can trigger integrations that match on email, like contact details, CRMs (Salesforce, Hubspot, etc), or custom plugins. If a user is not logged in, teammates using Front Chat will see their identity status at the top of the conversation. If a user is anonymous when they start a chat and logs in later, their name and email will be associated with their conversation as long as they have not cleared their cache/cookies. If a user is logged in and their information has been passed to the widget using the Verification Secret, you will not see an identity status on the conversation. 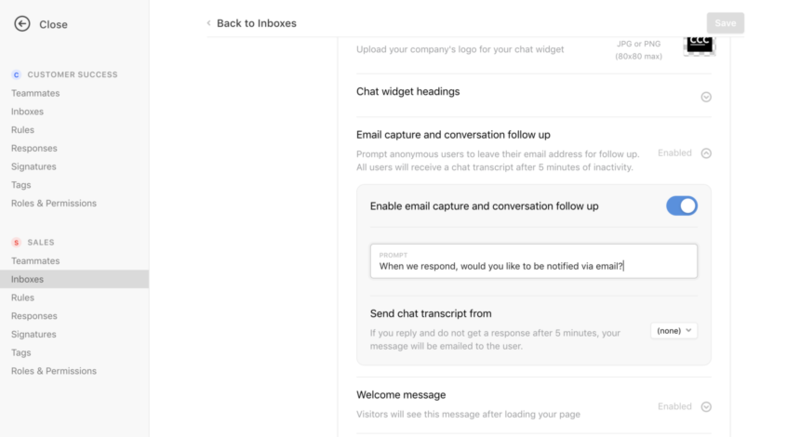 There is an option in your Front Chat channel settings to capture email addresses and send a conversation transcript after 5 minutes of inactivity (the “Notify Me" form you can see on our website).